Oooh I can’t believe it is nearly February 2016 already! Where are the years going? The first time I realised that years had ‘names’, was in 1995. It was the first time I wrote the full date (at the age of six) and it terrifies me that it was 21 years ago. With that bit of adrenaline out of the way, I’ll start off with a recap! 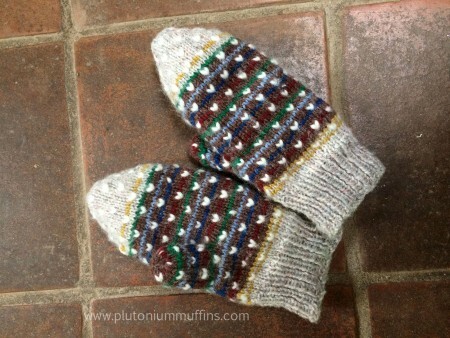 Monthly Resolutions were started in March 2013 here on Plutonium Muffins, and after a few months of doing them, a group was started on Ravelry. We are an active bunch who each set resolutions on a monthly basis, cheer each other on, keep track of what we are doing, and enjoy a bit of chatter. Come join us! I thought I was doing really well, but I’ve had some issues. Finish the ridiculous welly socks for my dad – done! Blog is here. Finish up some mittens I’m knitting for a friend – done! I still need to blog about them. Memory Mittens – the most triumphant of my January 2016 FOs! Start John’s Dr Who scarf – I ordered the yarn, but there was a problem with some of the dye-lots and I had to send some of it back. You can imagine how pleased I was. I ended up sending it all back, and I will go and choose the yarn in person so that I am absolutely happy with my colours. Knit commission scarf and hat set – I finished the hat, the yarn has arrived for the scarf and I will carry on with this next month. 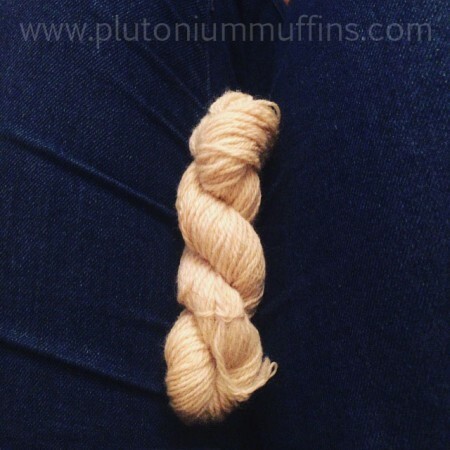 Spin some of my beautiful Australian fibre – I brought down a big braid of pink cheviot and started spinning it. I think I’ve done about 20g out of 100g, so this carries over the February 2016 Resolutions too. Knit a present for a Big Birthday – I completely failed – then planned to make the person a card instead and failed on that as well! Really need to sort this out. 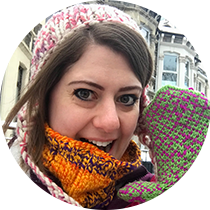 Knit a Christmas present – Finished a hat! It goes into the box. Finish the next section of my cross stitch sampler – I did indeed finish, and now need to look at what the ‘next’ section will be. I split the chart into 24 sections when I initially cut it all up, but I have to get it finished by May, so a section may have to become three cut sections. Too complicated to get my head around right now! 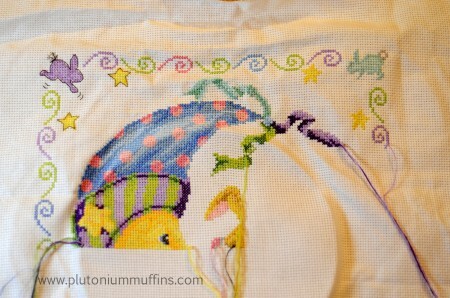 Bunnymoon cross stitch sampler at the end of January 2016. As you will see, some of these are follow-ons from last month. That last one is EXCITING! I have some blends that people will enjoy, I think, as well as some naturally dyed fibre that would be perfect for spinning or felting. Let’s just say that dyeing with dandelions is brilliant. Some dandelion spun from my natural dyed fibre. Look out for this fibre on Etsy in February 2016. I think that’s a good enough start to February 2016 at the moment. I may just add a few but I’ll let you know, no doubt. January 2016 was a tough one. I’d just like to say screw you cancer. We lost some amazing people this month. 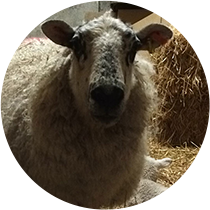 PS Ever wondered what a day on the farm looked like? Gas, Dust and Billions of Stars - free pattern! This entry was posted in Cross Stitch, Knitting, Resolutions, Spinning and tagged Dandelion, February 2016, February 2016 Resolutions, Mittens, Monthly Resolutions, Resolutions Monthly, Welly socks. Bookmark the permalink. You do that on YouTube, but no problem – you’ve told me hehe. Thanks as always for keeping it going :) Love seeing what you’ve been up to. Thank you so much! I will keep you updated!